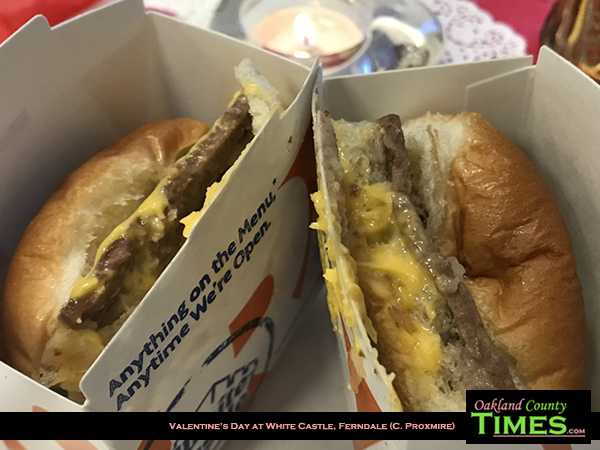 Royal Oak, Oak Park, Ferndale, MI -Even in this fast paced world there is time for great food….and romance as mentioned by Regional Director of White Castle for the Detroit Region, Mason Wolf. 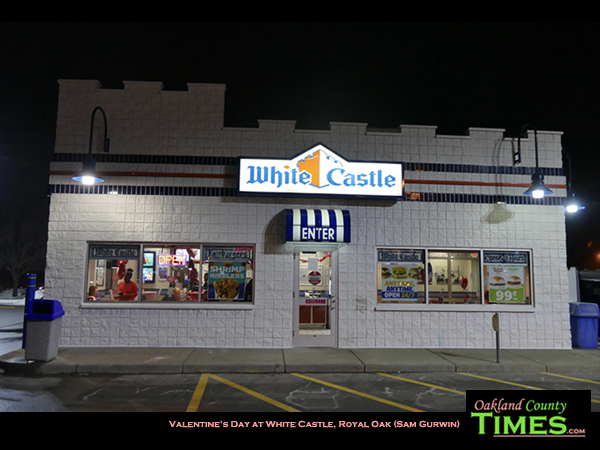 A 30 year tradition featuring White Castle’s motto of “creating memorable moments” happens on February 14th every year. 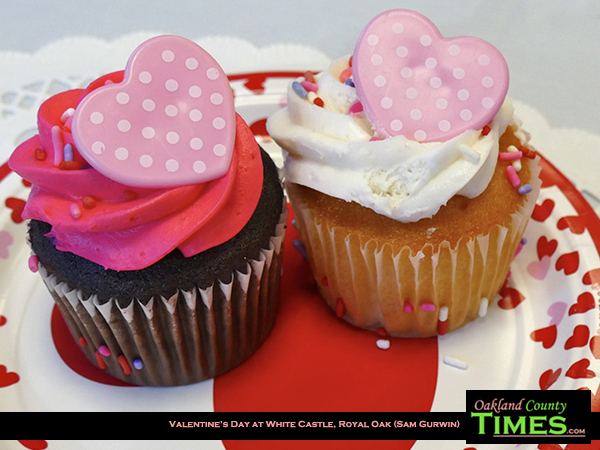 The moment we are speaking of is Valentine’s Day at The Castle. For one day a year, The Castle locks it doors to regular customers and takes reservations for an epic dining experience! Romance, smiles and great food are the order of the day! This Reporter had a very welcoming visit to the Oak Park location. 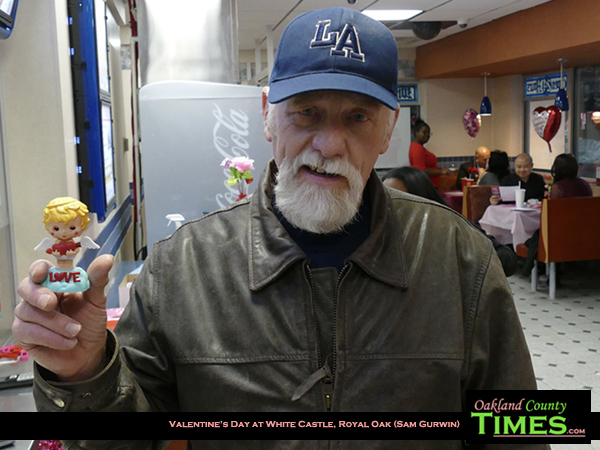 Manager Delbert Beasley was going to show me what the WHITE CASTLE VALENTINES was all about…I was going to get the experience! 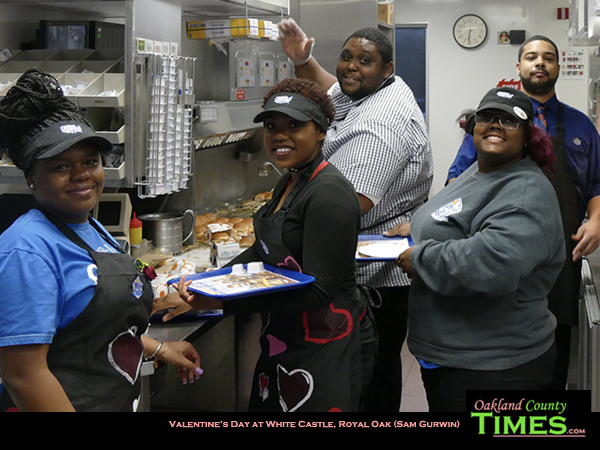 Waitresses Shadae Waller & Makarai served table-side for the main course and for dessert. The menu was a 2-page affair. Foods available from their new seafood items to a smoothie that will be around for a few weeks after this event was evident; also Sliders, Fish Sandwiches and more! Cupcakes for dessert! 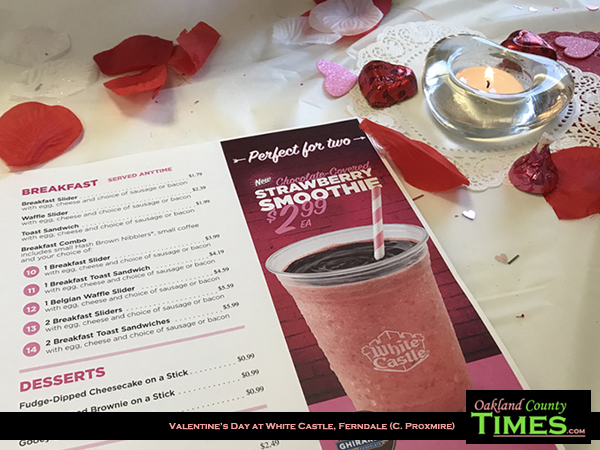 From the decorated table I sat and watched several couples enjoy conversations among the tables, smiling waitresses and an air of being special on this day of Love. 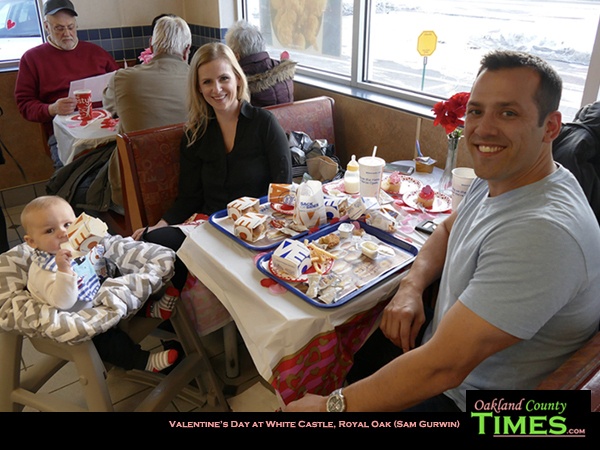 Married 2 years, this effervescent couple with Baby Jackson were all about White Castle. They joking said it is the key to long love. Young Jackson was toying with a French fry as Dad said he was getting him “use to the finer things in life”. This family, like a few I talked too said this is tongue-in-cheek of course. They did had White Castle at their wedding! 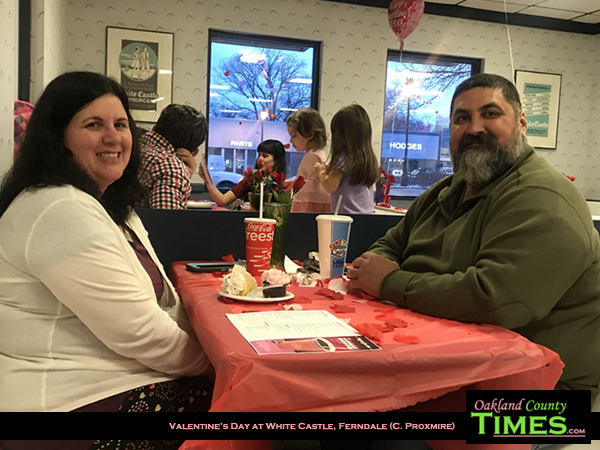 This family, like a few I talked to find interesting places to eat on Valentine’s Day- White Castle seemed the right place to experience more Valentine’s Day fun this year! This Family loved how “different” the experience was at this event. 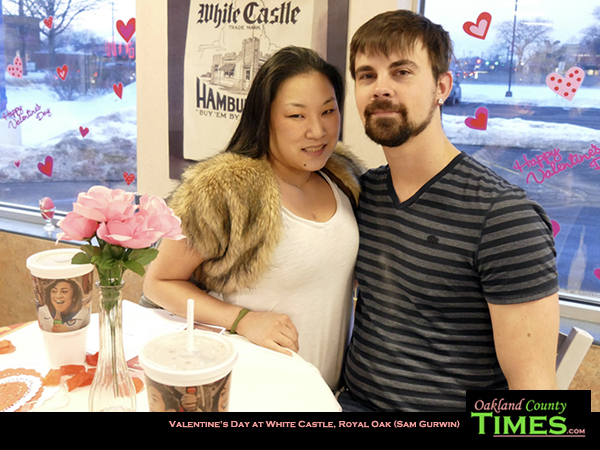 They go to a different Castle locations every year on Valentine’s Day. This couple with young Taryn think love lasts when “communication” and “friendship” exist. Taryn said the best part of the night was the “food”! This was a theme throughout the night, as everyone interviewed raved about the food and the uniqueness of this night. This young couple was enjoying the experience at the Castle. “Never go to bed mad” was their secret to a good relationship. I left this reserved couple to their fun night and noticed they were having fun through the evening. This group of 4 were having a grand time chatting with me and other patrons at the restaurant. Gene & Francie have been married for 53 years and their secret is (tongue-in-cheek) to “endure pain”. 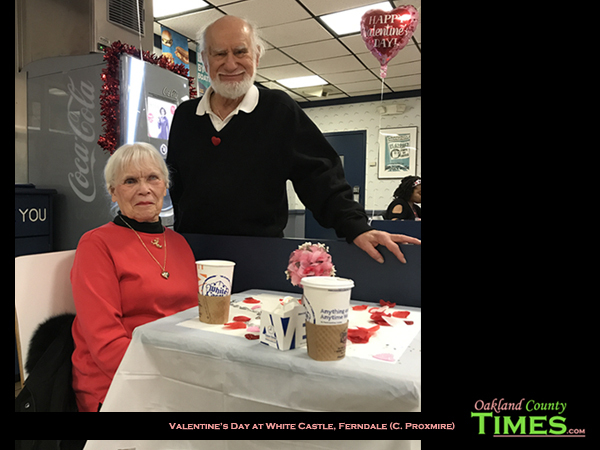 White Castle seems to be a part of their lives- at a recent 60th birthday party they had White Castle brought in! The same feelings & theme of The Castle being a paradox between being a fast food joint and a classy place tonight made this event sparkle. The ordinary turned extraordinary! 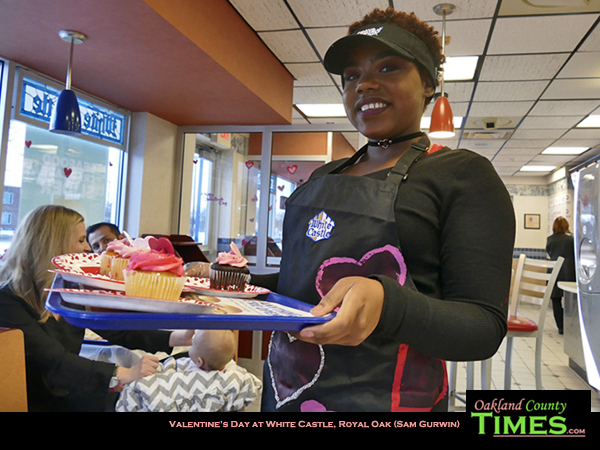 Another beautifully decorated White Castle in Royal Oak was stirring with Valentine’s Day Appeal. General Manager Lashonda Spillman thinks this event is “an experience for everyone”. 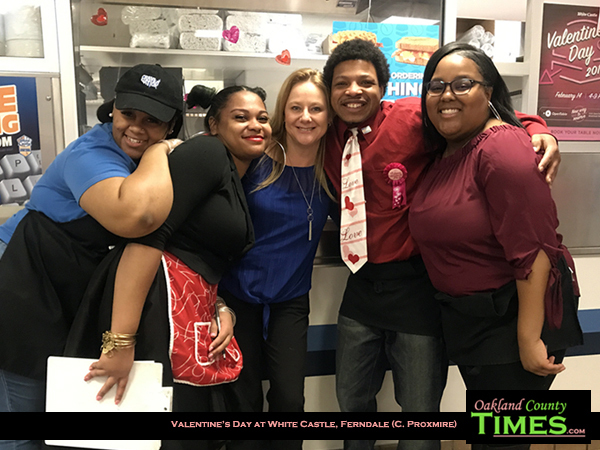 She has been with the Chain for 18 years- instilled charity work seems evident here too- her restaurant gives discounted food to the local hospital, firehouse and more. The Castle is active in the Community and on the Internet-front too. Technology this year in the form of a smart-phone application “Open Table” helps book tables at The Castles for this VIP event. The “App” is “pretty cool” says Spillman. 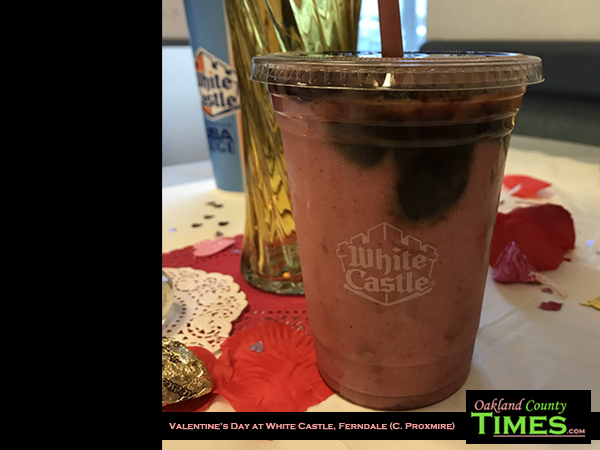 Two different aspects of love…like the dichotomy of fast food and a night of romance. Tiffany mentioned “separation” of a couple, as in needing space, as helping them get true love, while John said “talking about” one’s relationship is paramount. Later on both seem to be having a blast! 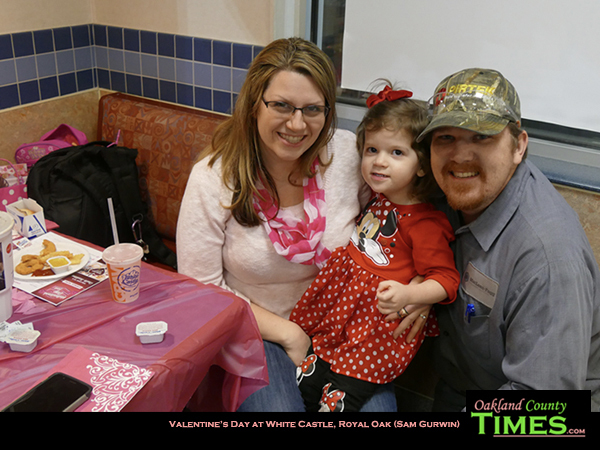 This family thought the event was fun with young Cecilia loving her chicken, fries and pink lemonade! She thought it was “great”! These guys were all about communication as the core of long love. Looks like they definitely achieved it! With a full stomach and a smile, this report is filed, with pictures from the Ferndale location to be added in. To say White Castle knows its place among the local population is an understatement. With a finger on the pulse of local areas, the family-owned restaurant gives back as much as it receives. They earn profits on the hearts and stomachs of loyal patrons that have had The Castle around in their lives for many, many years. 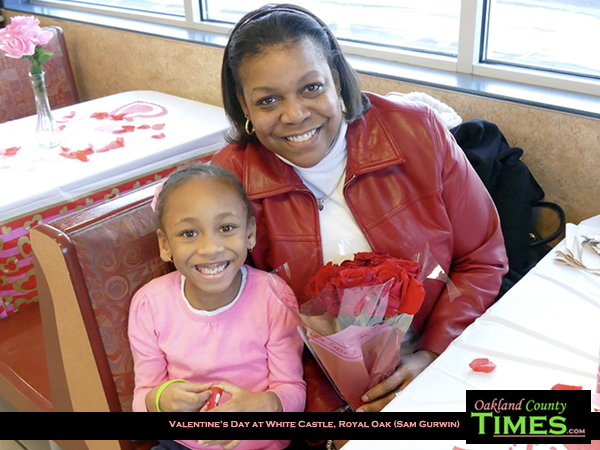 Both the young and older “Cravers” keep coming back, especially for the Valentine’s Day tradition. 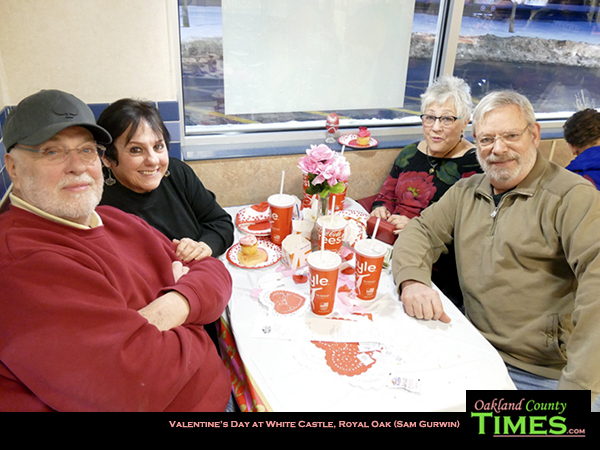 White Castle is the naming rights sponsor of the Oakland County Times Event Page. Check it out at http://oaklandcounty115.com/events/.